Auto Service Centers can be held responsible for damage to customers' cars or liability from driving their vehicles. These exposures to loss make business insurance for auto service centers different from those in other industries. Call us today for a review of your coverage. We've been specializing in business insurance for auto service centers for over 30 years. We have the expertise to ask the right questions and offer the right coverage. Whether it is your exposure to loss from damage to customers' vehicles, your employees' tools or injuries to your employees, we have the programs with the coverage you need at a premium you can afford. 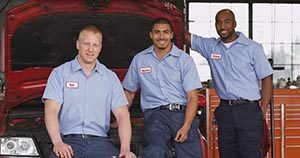 We provide Auto Service Center insurance in Miami, Fort Lauderdale, Palm Beach and anywhere else in Florida with a variety of "A" rated national insurance companies. We will come to your business location at a time convenient to you. Contact us for a quotation on your business today! There are a wide variety of business insurance coverages available to cover the potential losses that can be suffered by Auto Service Centers. Our agents will take the time to review each of these coverages with you.